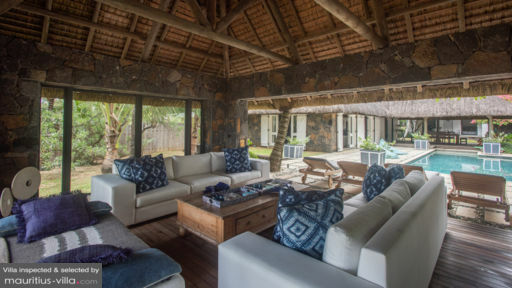 Well-suited to larger families, group vacations, weddings and more, Villa Nirvana places you on the scenic east coast of Mauritius, close to the beach. By this token, you will be able to go for a dip in the magnificent Indian Ocean whenever you feel like it. Best of all, the villa features plenty of communal entertainment options for when you want to mingle and socialize. You can also make full use of your own private spaces when you want privacy. Thanks to the numerous services offered, guests of Villa Nirvana can relax and focus entirely on their holiday in Mauritius. Villa Nirvana provides a total of four bedrooms, perfect for groups of up to eight persons. 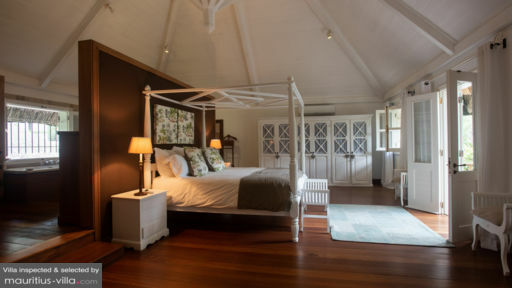 All bedrooms are beautifully-furnished, with comfortable beds and air-conditioning units to ensure that you have a good night’s rest before waking up to yet another beautiful day in Mauritius. Thanks to the outdoor living room, you will be able to take in the glorious weather as you lounge around and relax with your loved ones. You can also make full use of the outdoor dining room, perfect for Al-Fresco meals. When you want to cool off from the warm weather, rest assured that the villa does come with a refreshing pool into which you can plunge and float about or diligently work on your laps. The sprawling, beautifully-manicured garden is perfect for when you want to work on your tan and make the most of the famous Mauritian sun. Kick back in the spacious living areas of Villa Nirvana on those days when you don’t feel like going out. There’s a cozy living room that offers ample space for entertaining or relaxing. This particular space is enhanced by stunning albeit tasteful artwork which blends beautifully with the rattan furnishings. As the evening comes to a close, gather around the wooden dining table over a delicious meal, homemade or takeout. In fact, if you want to tuck into a homemade meal, rest assured that Villa Nirvana does provide a fully-appointed kitchen, complete with coffeemaker, microwave, gas stove, electric stove and more. Consequently, you will be able to easily whip up a homemade meal or your favorite snack whenever you feel like it. Additionally, guests can make full use of the TV room area to catch up with their favorite shows and movies during their holiday in Mauritius. Don’t worry about cleaning up after yourself while you holiday in Villa Nirvana: guests of the villa will receive the services of not one, but three dedicated housekeepers and one gardener who will take care of all the housework for you. This service is complimentary. Hailed as one of the best in Mauritius, the public beach of Trou aux Biches lies quite close to Villa Nirvana. Over there, it is possible to indulge in a wide array of exhilarating nautical activities that will help you explore those crystalline waters. Go snorkeling in the calm lagoon or rent a glass bottom boat that will take out far out to the reef where you can feast your eyes on stunningly colorful fish and corals.